Published on Friday, October 7, 2016. This article appears in the October/November 2016 issue of American Craft Magazine. 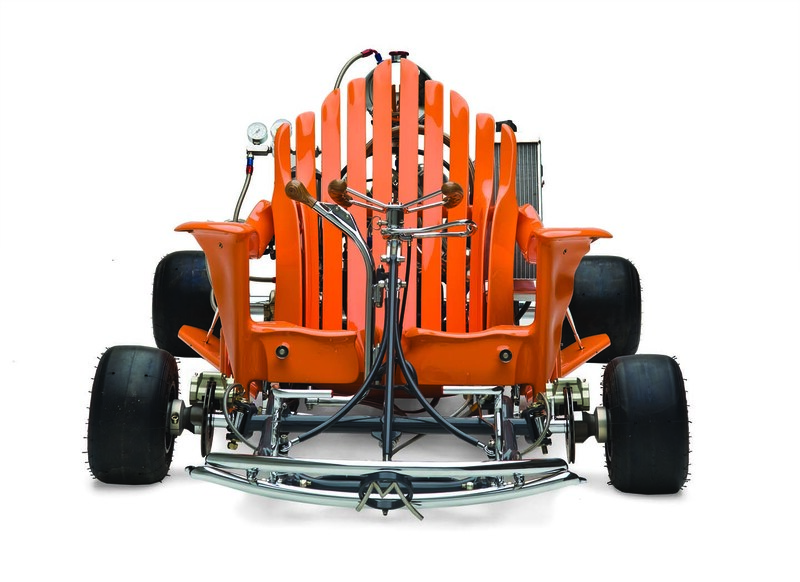 Cooper’s latest piece is a six-wheeled vehicle powered by 1910 reproduction Harley Davidson motors, with a chassis of triangulated steel and a body of laminated oak, recalling his 1975 Soap Box Racer. It’s been in the works for more than two years. “There’s nothing I do that happens in a day,” he says cheerfully. Some artists trace their path to childhood; they talk of growing up surrounded by fine-art influences. Not Michael Cooper. “I grew up in a small town,” he says, “and that just wasn’t part of our daily life.” What he did have – in spades – was exposure to craft, learning to work wood at his grandfather’s cabinetmaking shop. Perhaps it freed him; Cooper is among the most distinctive, imaginative sculptors of his generation. It’s easy to get lost in the fantastical nature of his work: How the West Was Won, How the West Was Lost (1977 – 2011) is a giant kinetic sculpture, featuring an oversized boot and oil derrick. 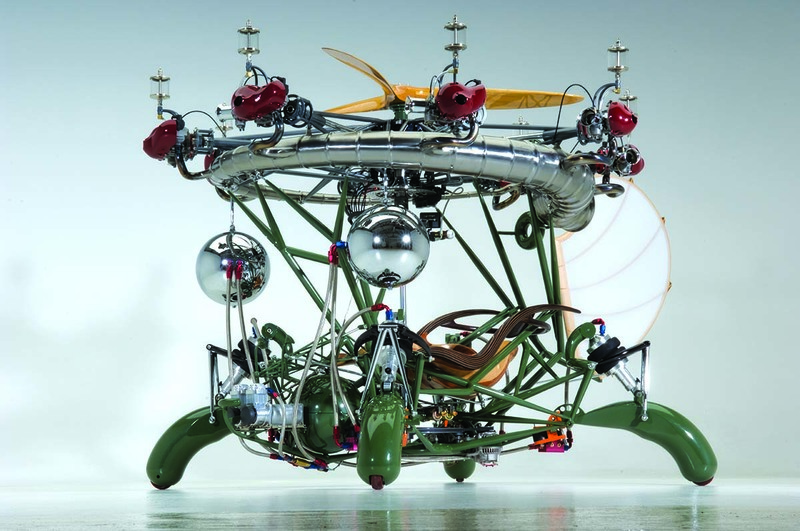 Or their poignancy: Trainer Tricycle (1993) reimagines the vehicle’s frame as a revolver. Impeccably crafted, they appear to have sprung directly from his imagination; that Cooper also makes these objects, moving fluidly among mediums, as much engineer and architect as artist, boggles the mind. Career highlights: Cooper had his first major solo show at the Museum of Modern Art in San Francisco in 1977. In 2013, a traveling retrospective organized by the city’s Museum of Craft and Design, titled “Michael Cooper: A Sculptural Odyssey, 1968 – 2011,” bookended that accomplishment. Read more about the 2016 American Craft Council Awards and winners. “A contemporary approach to a reclining chair,” Ride (2008) has eight motors that help provide lift to the pneumatically controlled hopping legs. Fired up, it has an “unbelievable sound,” Cooper says. Soap Box Racer made its debut at SFMOMA’s 1975 Soap Box Derby. The following year, it was selected for the legendary “California Design” biennial. As a young man, Cooper was held up at gunpoint at his father’s grocery store, and gun violence has become a theme in his work. 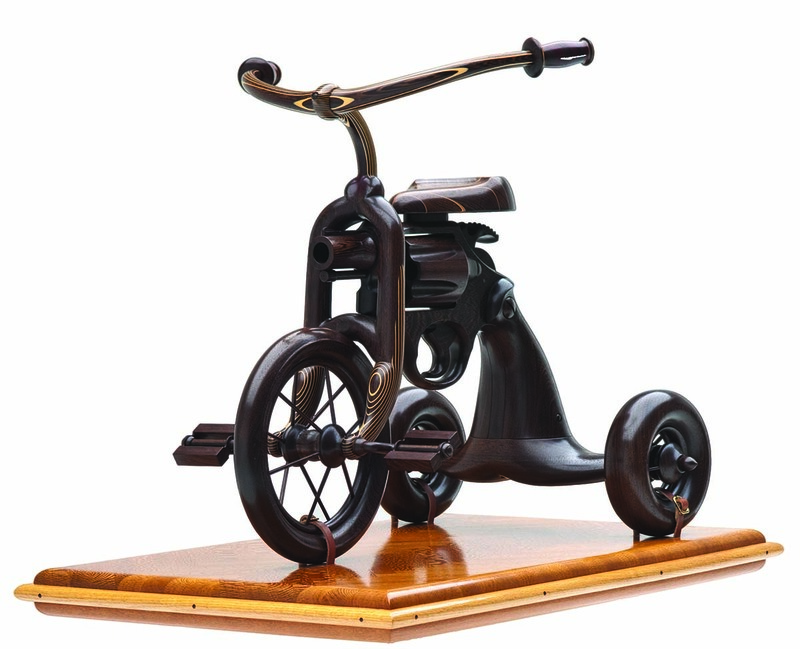 His Trainer Tricycle (1993), of wenge and sycamore – with a frame shaped like a revolver – is as relevant as ever. The ACC is pleased to announce the recipients of the 2016 American Craft Council Awards. Register today for the 12th national conference of the American Craft Council.